Thinking about getting some Muscovy ducks around your place? Well, then, what could be more adorable than a flock of fuzzy little Muscovy ducklings? If this is your first foray into raising ducks, you can buy your first baby ducks from a local breeder, feed store, hatchery or animal auction. You might want to avoid buying a commercial strain of Muscovies bred solely for meat production, as they might have lost their self-reliant traits. Brian Witt of Cassatt, S.C., secretary/treasurer of the International Muscovy Breeders Association, was attracted to the Muscovy ducks partly by their size and soft calls. Brian and his wife, Wanda, keep several hundred Muscovies for showing and selective breeding. They also sell many for the meat. When it comes to hatching duck eggs, the Witts encourage the female Muscovies to incubate their own eggs — until just before hatching. They then relocate the eggs to protect the ducklings from being killed by fire ants, a pest common in the South. The Muscovy ducklings live in brooders until they’re 1 month old; then they relocate to outdoor pens protected by electric fencing. Wherever the small Muscovy ducklings are reared, whether by their mother or in a brooder box, they’ll need fresh, clean water for drinking. Also, water pans shouldn’t be large enough that the female can climb in with her chicks and accidentally hurt or drown them. When you’re raising ducklings, you’ll need to know what to feed them. Young Muscovy ducklings can eat moistened, nonmedicated chick-starter crumbles or crushed waterfowl pellets, and cut fresh grass, dark lettuce or chard. Another tip for creating a healthy duck diet: A mesh bag filled with leftover fruit and hung out of reach is ideal in attracting small flies for the young birds to eat. 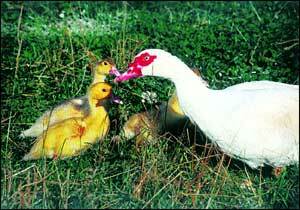 And Muscovy ducklings can become tame if they are frequently hand-fed a tiny amount of bread or other tasty treat. Young Muscovy ducklings are very susceptible to chilling, so if they’re kept in a brooder box, keep it at 85 to 90 degrees during the first week. The temperature can then be lowered gradually, by 5-degree intervals, over the following weeks. The temperature can be checked with a brooder thermometer and the baby ducks will offer signs if they are too cold (they will huddle together) or if they are too hot (they will pant and avoid the light). The bedding should be kept clean, and the absorbent wood shavings or straw should be changed frequently and be kept mold-free. If you would like Muscovy ducklings to become attached to you, rear three or four together, de Wit suggests. The Muscovies will become imprinted on you and others like themselves, plus these pet ducks will be company for each other when you’re not around. It won’t be long until you’re treated to one of the most amazing rural scenes: a tiny flock of tail-wagging Muscovies meandering through the green grass. Now that is a lovely sight. four colors of the Muscovy – white, black, blue and chocolate. more than two dozen additional color and pattern varieties. The male Muscovy probably wouldn’t win any domestic duck beauty pageants because of its caruncles, the red, fleshy outgrowths that dominate its face. But that makes no difference to Corine de Wit of Reva, Va., who began raising this species in the 1970s, when she lived in what is now called the Democratic Republic of Congo, Africa. The Muscovies on farms today trace their ancestry back to the wild Muscovy. They were a perching duck indigenous to the tropical regions of Mexico, and Central and South America. All other domestic ducks are derived from mallard stock. It is often said that the Incas of Peru domesticated Muscovies centuries ago, and kept them as pets to control pests and to supply feathers, eggs and meat. During the 1500s, conquistadors brought these ducks from South America to Spain. From Europe, the birds traveled to Africa, Asia, Australia and back to North America. Today, Muscovy ducks are not only found hunting bugs in Asian rice paddies but also on American farms, and they’re served for dinner in many villages and fancy restaurants around the world. Domestic Muscovies are large, well-muscled ducks. Females weigh around 8 pounds and drakes often reach 15 pounds. These birds are extremely self-reliant and will forage for tender grasses, pond and dry-land weeds, flies, slugs, snails, mosquitoes, and even mice, making them very handy to have around. Be very careful to protect young plants: Muscovies mistakenly uproot flowers and vegetables in their effort to locate worms and other soil-dwelling delicacies. They also like reaching up to pick ripe blueberries and raspberries from bushes. Muscovies have powerful legs, long tails, sharp claws and rounded wings to assist in navigating around trees. If left unclipped, many females and juvenile males fly extremely well and enjoy roosting on lofty perches like barn roofs. When provided an adequate diet, uncrowded conditions and protection from predators, they’re not likely to fly off in search of greener pastures. Unlike the females, the adult drakes are essentially grounded by their hefty size. They also possess feisty temperaments and pick fights with others when territory or females are involved. Many plucky drakes may try standing up to predators much bigger than themselves. For folks used to the noisy quacking from a flock of Pekins or mallards, the sounds from the Muscovy may come as a pleasant surprise. Drakes make a breathy whistle while the females typically emit a soft squealing noise unless they’re scared or angry. This can be an advantage if you have neighbors nearby who don’t enjoy ducks as much as you do. Although these waterfowl love swimming when given the chance, they are usually more terrestrial than other domestic ducks and their feathers appear to have less waterproofing. Because of this, a pond isn’t needed for Muscovies and can potentially pose a hazard during icy winters, as these ducks of tropical origin might become chilled or suffer frostbite. When deciding whether or not to add Muscovies to your poultry family, remember, like most waterfowl, they are messy. Ducks produce profuse amounts of soft, smelly droppings (which is a great fertilizer for your grass or garden) and they distribute feathers everywhere during molting periods. Also, the Muscovy’s large size, strong wings and sharp claws make catching and holding the birds nearly impossible. Duck-catchers will want to wear heavy gloves and long-sleeves for protection, and constantly hold the bird’s beak away from the face. Never catch your ducks by the legs as it may injure them. Duck eggs can be used just like chicken eggs when cooking; they have a firmer texture when cooked (making them perfect for angel food cakes) and a higher cholesterol content. excellent setter and protective mother. Enthusiasts like Muscovies for their self-reliance, but they do need correct daily care to thrive and reproduce. Some duck raisers buy a balanced commercial diet specially made for waterfowl or poultry; others make their own concentrated feed from assorted grains. The Witts do both: They make their own feed from grains and sunflower seeds, and offer unmedicated layer pellets to the adult ducks at laying time. “Medicated feeds aren’t necessary for ducks and can cause health problems,” Brian Witt says. 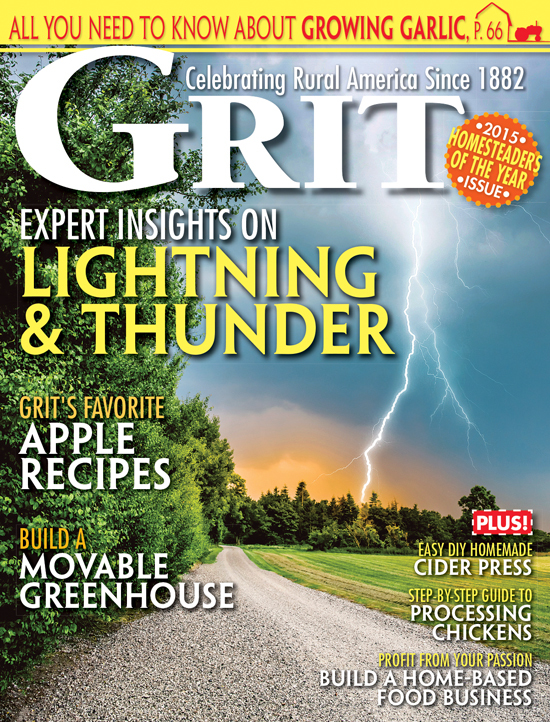 A basic diet like the Witts use may be supplemented with vegetables, fruit and table scraps. However, be very careful to never offer moldy food items which can cause your birds — especially ducklings — to develop the lung disease aspergillosis. Grit or coarse sand is also needed by ducks to help digest their food, and they always need fresh, clean drinking water. The containers should be deep enough to allow the ducks to submerge and clean their nostrils; they should not be deep enough to swim in. If you don’t have a pond for your ducks, try providing a child’s plastic wading pool during warmer months. Devise a plan for them to get in and out, such as some big rocks or a concrete block step, and make sure to change the pool water regularly to keep it clean. Muscovies are strong and hardy waterfowl and they don’t require highly structured housing like chickens. All the same, they do need shelter from freezing or extremely wet weather, and protection from predators such as coyotes, foxes and owls. If your ducks roam free during the day, luring them into an animal-proof enclosure at night will help a lot toward preventing losses from predation. A well-bedded shelter can also help protect ducks from frostbite in colder climates. “I leave my ducks unclipped, so they can at least have a chance of getting away from dogs and foxes,” de Wit says. “At dusk, we lead them into a pen with a 5-foot wire-mesh fence around it.” She considers roaming dogs to be the No. 1 Muscovy enemy. Muscovies are very resistant to parasites and infectious diseases when kept in clean and uncrowded conditions, and when provided a proper diet. Vaccinations usually aren’t needed in a small flock, but you may want to ask your veterinarian experienced in avian medicine for his or her thoughts, especially if certain diseases are common in your area. Watch your ducks for any signs of illness such as fluffed feathers, lethargy or poor appetite, then immediately isolate sick birds for treatment. Any newcomers from other farms should be quarantined for 30 days before being added to your permanent flock. We live in a downtown city, Tacoma, WA. and have had a muscovy adopt our flat roof top. She showed up about a month ago and has made her way into our hearts. She was standoffish at first but has now made her self very at home and stays very close to where we are The rooftop of the lower addition to the house has her at the level of our living room and office and she curls right up to the window to visit and rest. She’s letting us pet her too. I see her out foraging daily. We also give her oats, kale, grapes and she loves blueberries. The first three weeks she didn’t loose any feathers. Then we had one here, two there. Today I came home to find 9 feathers. Is this normal? Should we be concerned? What should we do? It has been very rainy and windy lately too. I would love any advice! Thank you! I have had wild moscovy ducks for the last 8 months, momma & 16 babies. I love them and feed them everyday so fun to watch and the actual come when I call them. 3 days ago Inoticed the momma missing..now I’m panicking, searching the neighborhood etc..no momma what happened? Did she leave? She has always been right by their sides. Does the mother go off and have other ducks and leave her grown ones? Is it illegal to own or sell Muscovy ducks in New York State? I’ve been reading that there is a federal law against even owning them. Can someone give me some clarification? I would like to start a Muscovie farming on an open field (small farm), How many Muscovies do I need to start with for commercial purposes and for how much money may I sell one Muscovie in order to make a profit of N$10,000.00 p/month. Please advise. Do the male Muscovy ducks mate all year or wait until spring. Our guy so no interest in the girls. I’m wondering if i should get a new male or will he get busy when it warms up. is there a rule about inbreding? I have a family of muscovies (9 from the litter) and the drake. The babies are now around 6 months old. There is one that I have had to save because it almost drowned from being infected by botulism toxin. It fully recovered but now is not hanging with the group. She rejoined the group a few days after she recovered but now- almost 3 months later- is now at a different pond and does not come with the others.. Any ideas?? 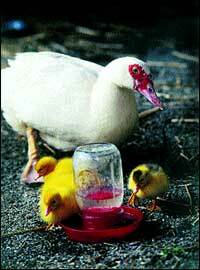 I want to start a muscovy duck farm where in south africa can I buy ducklings? I am a serious farmer would like to buy 200 ducklings the first month and there after 400 ducklings a month, please can anybody push me in the correct direction!!! 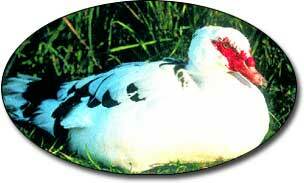 Visit gumtree.co.za and look under muscovy ducks. When I bought my chicks from a couple of ladies a few towns over, I also purchased three ducklings that were supposed to be Muscovies. After 20 weeks, they still do not look like Muscovies. Also, I do not know if I have male or females. They may all three be females, if so at what age would they form their caruncles? One that looks to have the color of a mallard quacks the other two that are predominately white haven’t quacked yet. Muscovys don’t quack, but they are known to “honk” if frightened. We have a small flock of 8. Soon to be 5 again until our hens (ducks) sit on another clutch. I have normaly been harvesting around 18 weeks. By that time the males are a full 1/3 bigger than the females and just starting to get a set of carbunkles. at 4 months old they have a brown or blackish flesh patch around the eyes and beak, but no red carbunles yet.